Puff pastry rounds make the perfect base for this early summer salad. Serve them freshly cooked with the creamy sauce melting over, or chilled if the weather is warm. Preheat the oven to 220°C, gas mark 7. Grease a large baking sheet and sprinkle it with water. Thinly roll out the pastry on a lightly floured surface and cut out 4 x 12-16cm rounds, using a saucer or small bowl as a guide. Transfer to the prepared baking sheet and prick the rounds all over with a fork. Bake for 15-20 minutes, or until the pastry is well risen and golden. Meanwhile, place the eggs in a small pan and just cover with cold water. Bring to the boil and boil for 4 minutes. Drain, cool slightly under cold running water, then peel and discard the shells. Mix together the crème fraîche and pesto and place in a small serving dish. Cut the leek lengthways just through to the centre and rinse under cold running water. Cut diagonally into 1cm-thick slices. Heat 2 tablespoons of the oil in a large frying pan and stir fry the leek, asparagus, salad onions and runner beans for 5 minutes, or until tender but retaining their texture. Season generously and stir in the capers, the remaining oil and the vinegar. Quarter the eggs. Transfer the pastries to serving plates. 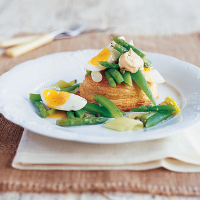 Pile the vegetables onto each pastry round and add the quartered eggs. Serve topped with some pesto crème fraîche.